Zsa Zsa Gabor's husband says she had a "great time" at her anniversary party. The 94-year-old actress and her husband Prince Frederic von Anhalt were joined by 100 guests at their Los Angeles home on Sunday (14.08.11) to celebrate 25 years of marriage, and despite the ailing screen legend unable to get out of bed - instead watching the revelry on a video screen in her room - her spouse insists she enjoyed every minute of the four-hour afternoon bash. He said: "Some people are mad because I'm throwing a party and my wife is sick in bed. But the doctor was there the whole day and said it was the best medication we can give her. She was smiling the whole day. The party was her idea. She wanted it so badly. "This was a party for me and my wife and nobody else. She's 94 years old. If we're not going to do it now, then when? When she's 100? If my wife was in pain and screamed, I wouldn't throw a party. But she smiles. She had music. She had a great time." Frederic employed security to guard the door of Zsa Zsa's room but says his wife - clad in a pink dress, make-up and tiara - spoke with around 20 people in German, French and Hungarian, as she tucked into caviar, champagne and other delicacies. Frederic told the New York Daily News newspaper: "I asked if she wanted to see Phyllis Diller, and she said 'I love Phyllis', so I brought her in. Then Quincy Jones got to come in. And they talked and smiled." 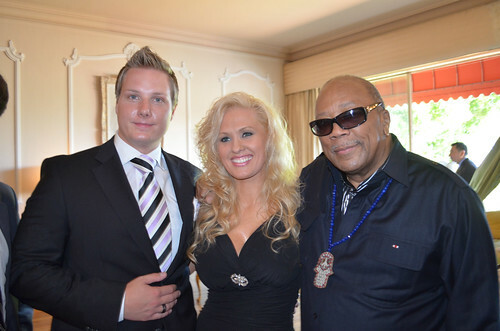 Quincy Jones, Phyllis Diller, Robert Blake, Darcy Donavan and Frank Stallone were just a few of the special guests attending the party.